With both gardens almost locked-down for winter it’s time to start writing about some of the places that have not yet made it on to The Frustrated Gardener. 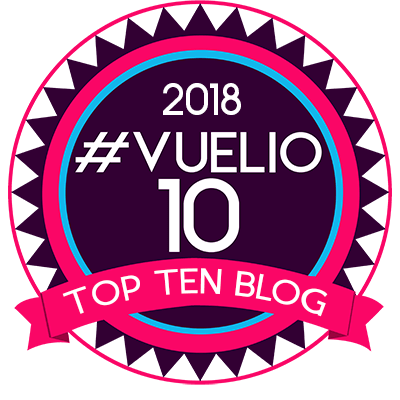 These half-forgotten visits are like blogging hay – sweet, fragrant and reminiscent of a time when the earth was warm and the sun high in the heavens – energy packed fodder that will feed my imagination through the cold months ahead. I need not travel back too far in my memory to recall our last visit to The Salutation, a beautiful Lutyens-designed house and garden in Sandwich, Kent. 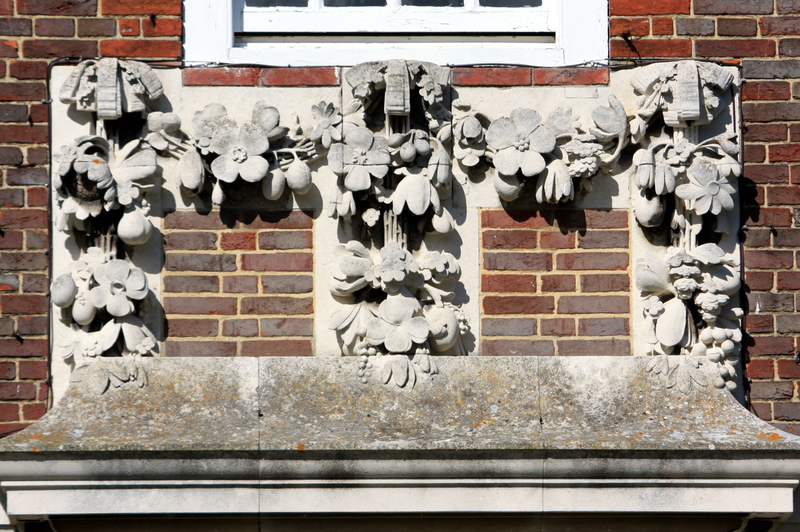 I am an Lutyens disciple, more so that I am a Jekyll one, principally because Lutyens combined an exceptional eye for tradition and detail with enormous ambition. If I had a spare £4.5M The Salutation would be the perfect purchase, for alas the property is on the market and the future of the garden is once again uncertain. 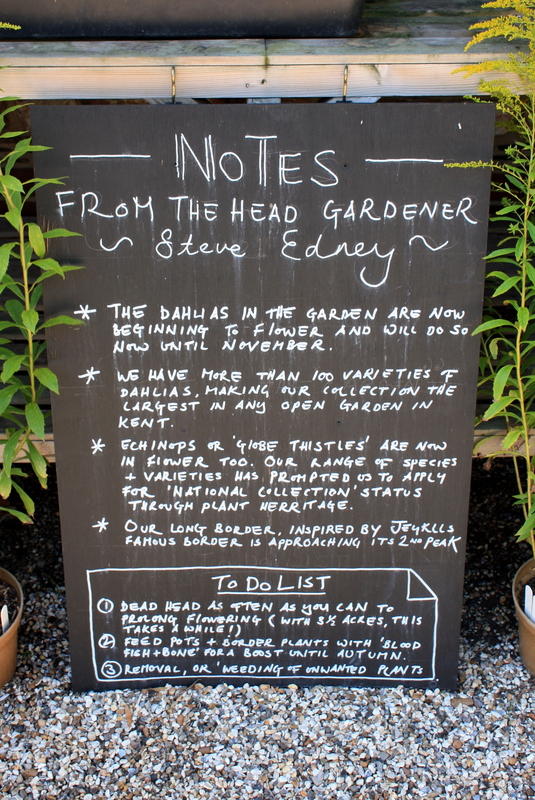 In the meantime, the garden goes from strength to strength under the leadership of Head Gardener Steve Edney. We visited on a warm day at the end of August, when the borders were alive with bees and the tender perennials were reaching their peak. The Salutation possesses a collection of more than 100 dahlias, which Steve believes to be the largest of any open garden in Kent. At this time of year dahlias are worth ten times the price of their fleshy tubers for sheer flower power. One that caught my eye was bluish-pink D. ‘Lilac Time’, a formal decorative type with dramatically recurved petals. 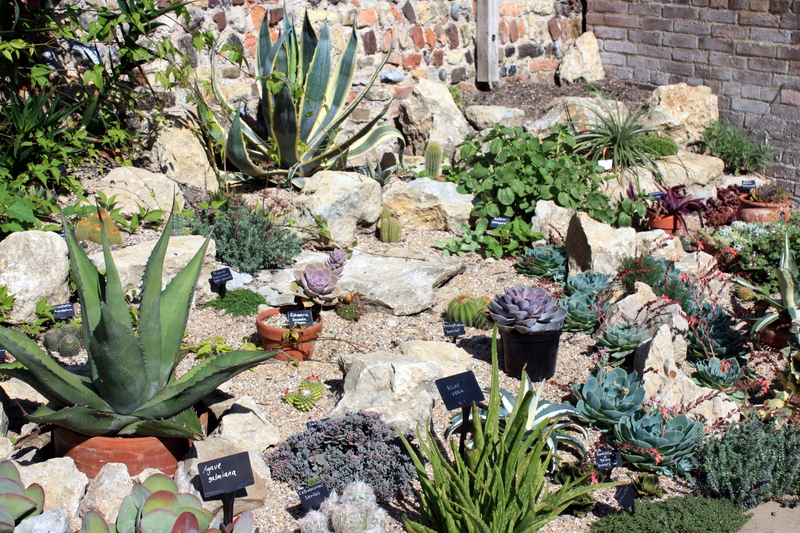 A new development at the entrance to the garden is a succulent bed. This replaced a display of tender perennials straying over from the border of exotics on the other side of the gateway. In this sunkissed nook basked Aloe vera, Cephalocereus senilis, Agave salmiana and assorted echeverias planted amongst fragrant thyme. In just a small space it was fascinating to see what could be crammed in. This type of feature could work well in a small garden, provided there was somewhere to overwinter the less hardy species. Visitors approach the magnificent long borders from a path at the side of the house, bounded by lush tropical planting. Bananas, salvias, cannas and gingers abound in this exuberant alleyway giving a genuinely jungly feeling. 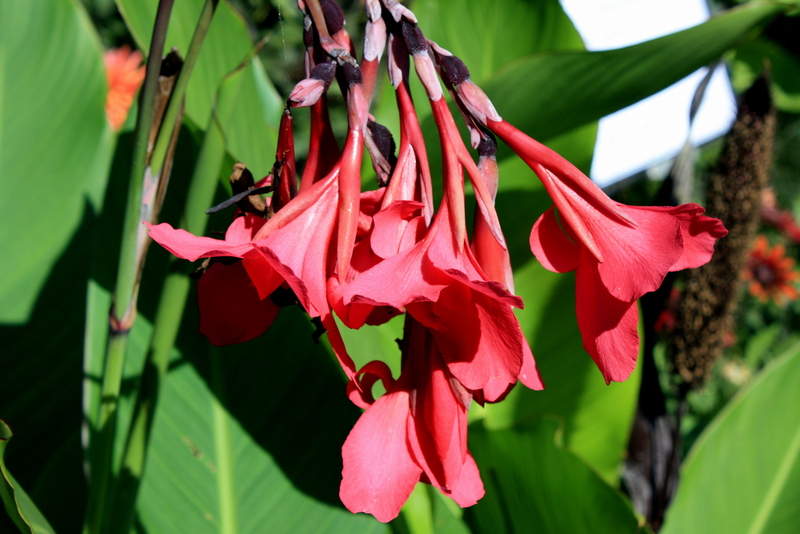 One of the most impressive of the cannas, C. Iridiflora ehemanii, was dripping with lipstick pink flowers. This plant needs space and shelter, but it’s an absolute beauty and a plant I’d like to find room for one day. 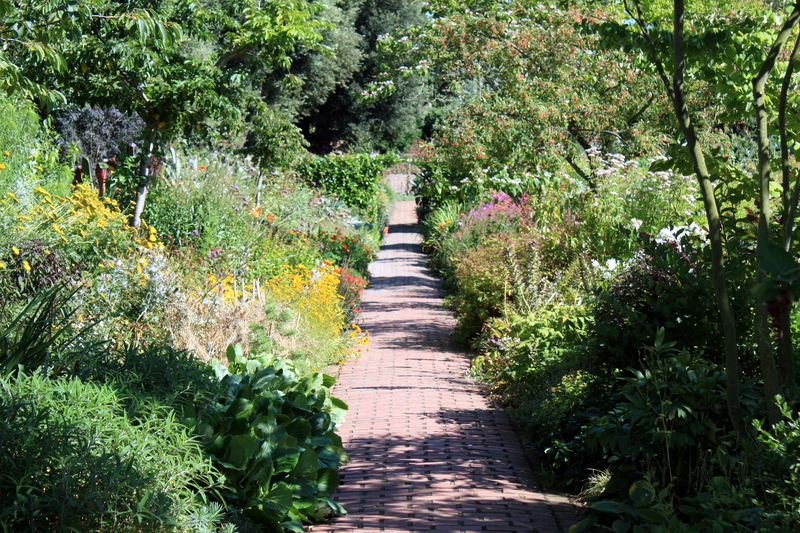 The first glimpse of Lutyens’ master plan for the garden comes next, in the form of two long borders. The planting is inspired by Gertrude Jekyll’s famous style, which involved carefully contrived colour gradations, often from pale to bright and back again. Packed with rudbeckias, heleniums, salvias, echinops and achilleas the scheme was reaching its second crescendo at the end of August. A row of massive holm oaks which shelter the garden create a rain shadow, so anything planted in this part of the garden has to be tolerant of drought. Hedge trimming is not a garden task I have to contend with, for which I count my blessings. However I greatly admire those that manage to achieve pristine, crisp lines for others to enjoy. 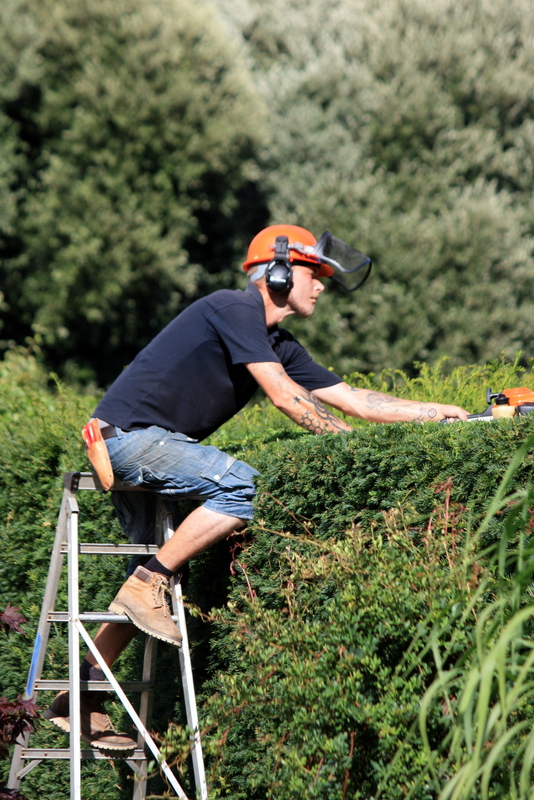 The yew hedge surrounding the sundial lawn was getting a professional haircut from this guy, who made it all look so easy. The borders on either side of the lawn frame the red brick facade of house and were filled with an unusual combination of bedded-out plants in tones of sage green, buff and burgundy. This was a classy look, befitting a classy residence. 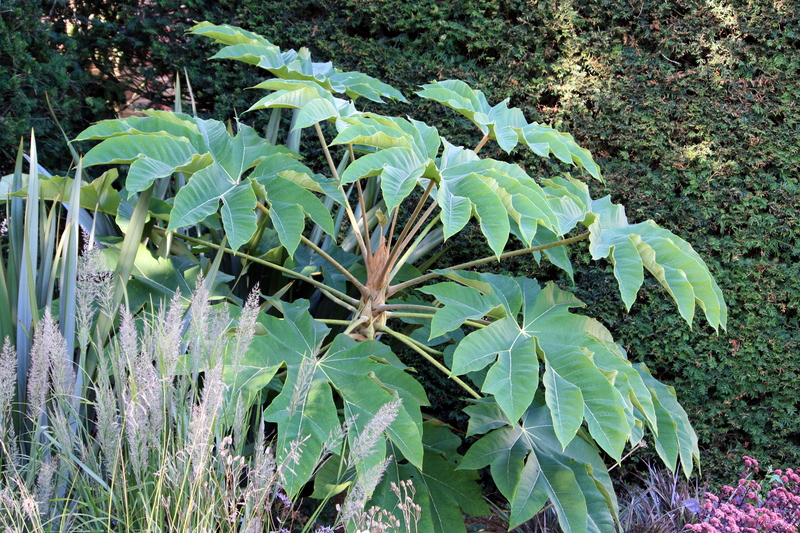 Each bed was terminated with a statuesque Tetrapanax papyrifer, a plant which never fails to impress. Standing out sharply against the dark yew, its architectural form was nicely softened by a mass of swaying grasses. Sheltering in the lee of the principle facade we found Hedychium ‘Tara’, a ginger which I consider to have more attractive flowers than H. ‘Stephen’. 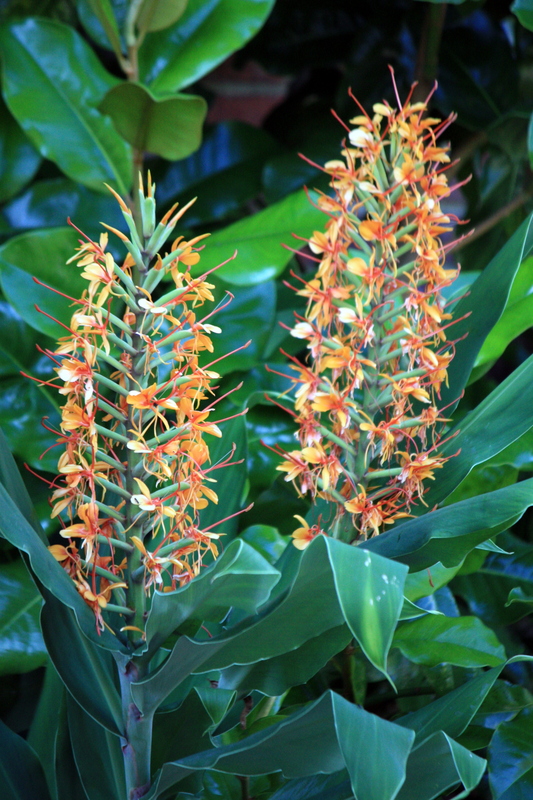 The flower heads are somehow fuller and the colouring more showy – if you are growing gingers then you are not generally looking for subtlety. If sublime architecture and beautiful flowers are not enough for you. 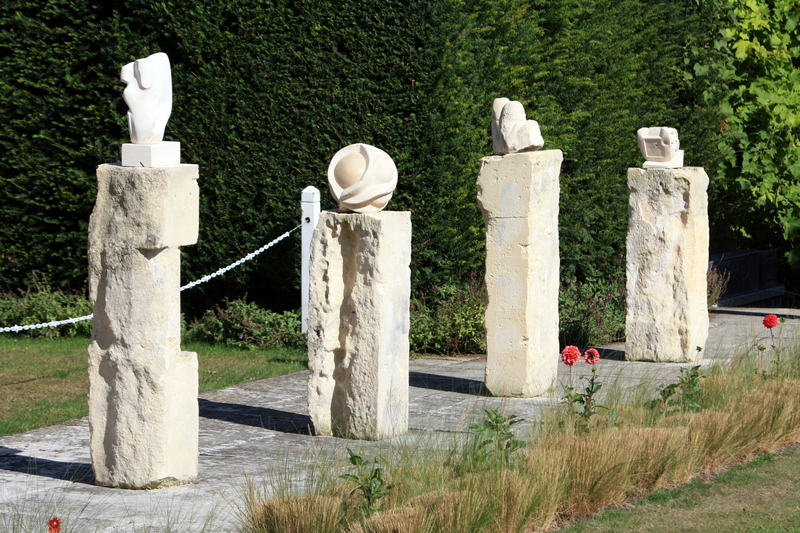 Then The Salutation can usually be relied on for a intriguing display of sculpture. If there was any information about these carefully hewn sandstone forms then I missed it, but they made an interesting feature, complementing the carved details of Lutyens’s house. 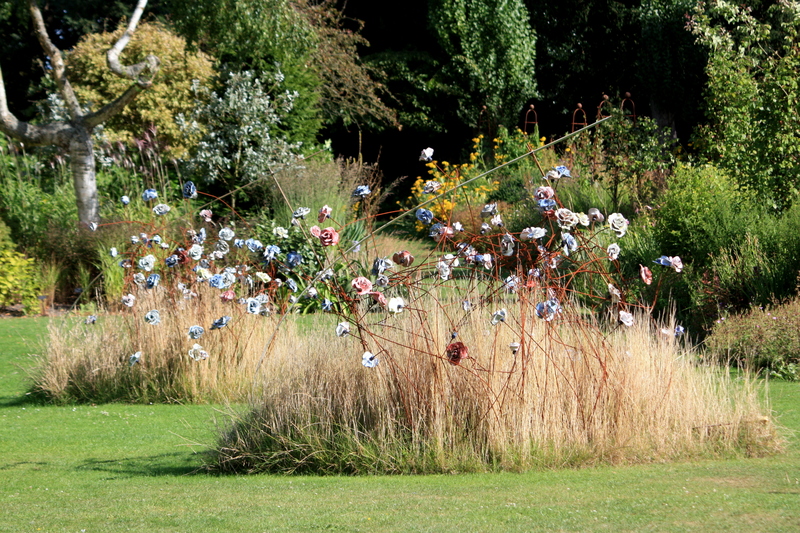 Surviving from last year’s installation were three grassy islands enveloping Paul Cummins’ ‘Ceramic Roses’. The stems of the flowers had rusted, which suited the antique tones of the porcelain blooms. I wasn’t sure I liked this piece when I first saw it, but with age, and amongst the tawny grasses, it has settled into the garden nicely. I hope The Salutation will find a wealthy, sympathetic new owner and that we’ll be able to return again and again to witness the quiet evolution of this unique garden. Follow these links to read about different aspects of The Salutation. Beautiful writing Dan, and some great photos. Although I enjoyed the picture of the handsome hedge trimmer, I especially loved the dahlia, must be my age! Yes, nice jaw-line I thought! Essential for hedge trimming ;-). 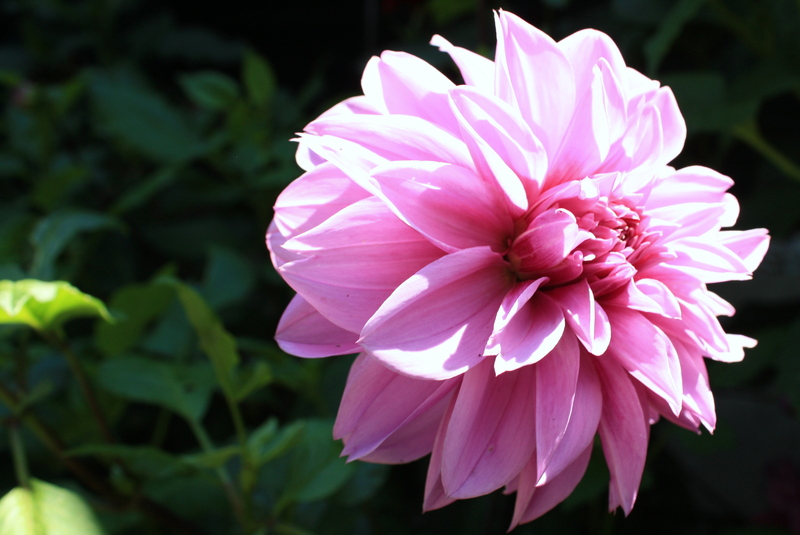 The dahlia is probably more reliable and lower maintenance, so a good choice. Dahlias are making a comeback and about time too. For years people only grew the ‘tasteful’ Bishop of Llandaff. What an amazing place; definitely on my ‘to visit’ list. Great photos. Thank you for the lovely comment. The Salutation is definitely worth a visit. They have a good trial bed where visitors can compare and contrast the different classes of dahlia, plus lots of other varieties worked into the main borders.